spent outside the studio. Errands in Red Deer and Lacombe...winter tires exchanged for summer ones. Groceries. Celebrant at Evensong in lieu of our priest who is on holiday. Brief kaffeeklatsch with my friend, A, during which there was reciprocal show and tell. Her latest hand-quilted applique quilt -- combination of applique and broderie perse is exquisite! 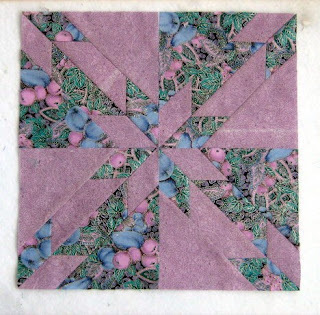 Now home to catch up at The Desk and move into the studio for some piecing of P's quilt (the Hunter's Star) during this evening's Quilt Cam. Meanwhile, for your viewing pleasure, I have to thank my cyber-friend Pat of Altering Thoughts for sharing the wonderful work of Hilde Morin. Enjoy! Love Hilde's work-those are the coolest fiber bowls I've seen!